Abdominal pain is the most common liver cancer symptom. Unexplained weight loss and unexplained fevers are the warning signs of liver cancer.Commonly, a sudden onset of complications are the initial presentation of liver cancer. Sudden appearance of jaundice, ascites (abdominal fluid and swelling), and muscle wasting without any precipitating factors like alcohol consumption actually suggests the presence of a liver cancer. 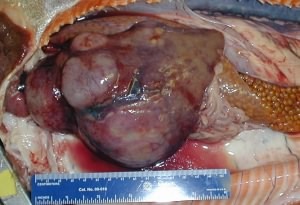 Enlarged liver is the most common finding on physical examination. Liver cancers are vascular tumors.So, increased blood flow in the hepatic artery cause tumultuous blood flow in the artery. This turbulence in the liver causes a specific sound in the liver which can be detected by a doctor with stethoscope. Liver cancer spread to the lungs most frequently.